If you have kids...then you have CLUTTER!!! If someone out there has kids without the clutter, then please post a comment and tell me how you do it, because I don't have a clue on this one! I woke up this morning and my house looked like a movie theater following a midnight showing of The Rocky Horror Picture Show!!! For those of you who have never heard of that movie, it was popular when I was a teenager. People would come to the midnight movie dressed as the characters and carrying various props that they would throw during the movie. For example; at one point an actor says "A Toast!" and everyone in the theatre starts throwing toast. You know...the wonder bread kind of toast. I remember feeling grateful that it wasn't my job to clean that theater! But now I have my own "Real Life" horror movie and it's called Attack of the Endless Clutter!!! It's very similar to the movie Groundhog Day because it keeps repeating itself over and over and over!!! And clutter is not the only thing that makes me feel like I'm living in a movie theater. As soon as I got the house picked up so it didn't look so much like an I-80 rest stop, I began to notice that my feet were sticking to the kitchen floor. You know that feeling when you have your popcorn in one hand and your drink in the other maneuvering through the dark to find your seat and suddenly you step in something that not only makes your foot stick to the ground but makes that duct tape peeling off the floor sound. YUCK!!! That's what it's like walking through my kitchen right now! I'm not really sure what was spilled and quite honestly I don't really want to know! I've tried to eliminate or at least reduce the amount of clutter in my home. Last week the kids and I had a family meeting and we talked about picking up after ourselves. Then we spent a couple hours together picking up the whole house. I have to say that it looked very nice! So why does it take only 10 minutes to create the clutter that takes two hours to pick up??? I truly believe that clutter is a mystery of the universe that I was not meant to understand. Kind of like watching a magician make his lovely assistant disappear. You watch it with your own eyes. You know there has to be a logical explanation and yet...it remains a mystery!!! 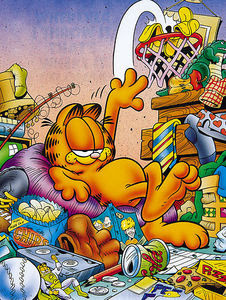 Maybe I could get that magician to come over to my house and do something about all this CLUTTER!!! The reason I laugh outloud is because your describe real life situations in such a funny way. You have got to get these published. very true, and very funny! it's a great thing that i don't have kids!